Or I guess I should say…….. The uses are endless. And you can make this little board fit the theme of any of your decor. So it blends right in. I just needed a solution for wet art that was making a mess touching other things in my home. And then I covered the front and sides with a nice layer of Mod Podge. Then I covered some jumbo wooden clothes pins the same way. But only the front of the pins. Next, I let everything dry completely and the hot glued the jumbo pins to the board. Lastly, I added ribbons and buttons….but that’s completely optional. Great for all sorts of purposes. I could definitely use this in my office. I hope your move is going smoothly! I love it! I made something similar years ago, but using liquid nails to adhere the pins, to hang a crib quilt on the wall. Worked great and was sooo cute! Thanks for sharing this idea – I definitely will try it with the fabric and modge podge for my new office. I love this idea. I am going to have to try this the first chance I get. So cute! 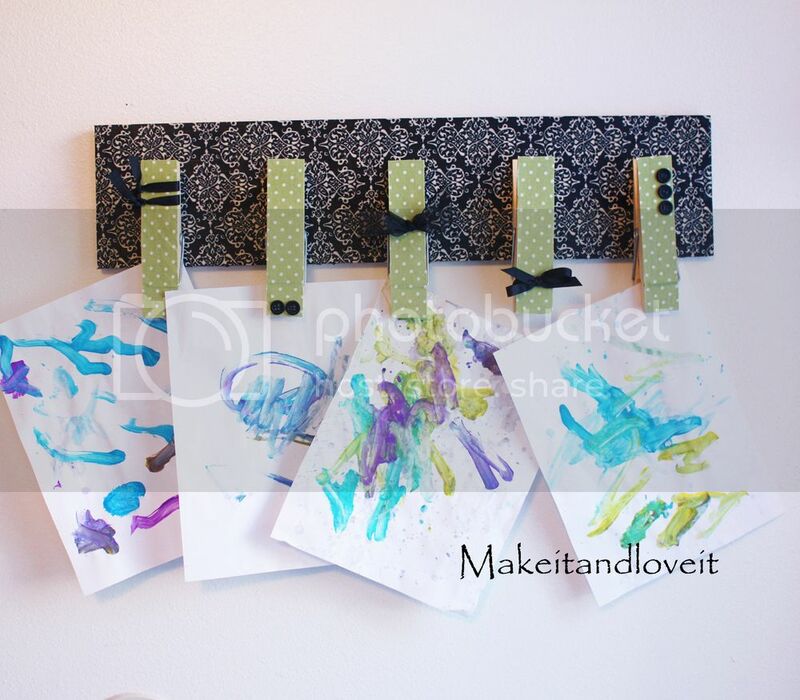 Oh this is a great idea, I am constantly looking for a place to dry my daughters paintings & glued stuff. I will have to try this once my craft/office is done! Thanks for sharing! Good luck with the move, hope all goes smoothly. So cute! Hope your move went smoothly and you had a fantastic Christmas!! This is an awesome idea! May be just what I was looking for to organize my space a bit! Thank you so much for the tutorial! I love this idea! 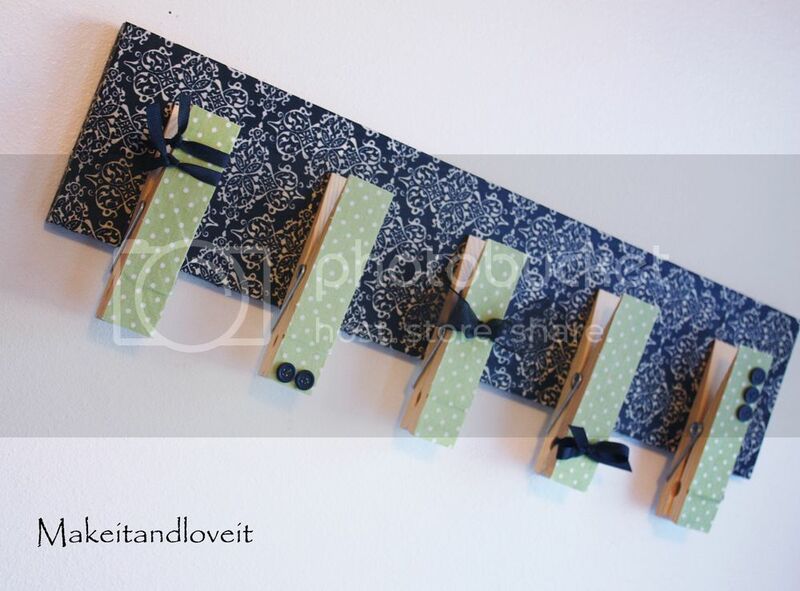 I really need to buy clothespins, because I keep seeing crafts I want to do with them. Would definitely come in handy for drying wet artwork, but I also think I'll make one for bills and hang it in a recess where it is a bit out of the way. I just got a new label maker, and I might label the pins "paid – to be filed," "need to pay," "need to make a phonecall" etc. 2010 is my year to get organized. Thanks for the idea! This is a GREAT idea and a perfect one for gift ideas! Thank you. Great idea! I love the use of the fabric.Where do you buy the jumbo clips? So darn cute! I'm totally going to make each of my kids one for their rooms to go along with the over crowded magnet boards. genius! this will be so handy! super cute, what a great idea! I was wondering if you or any of your readers had any ideas for a cute jewelry type holder. One that could hold stud earings, hook earrings and a couple watches/bracelets. Ohhhh! I LOVE this idea!!! I love this idea, I was looking for a way to hang up all my aprons and I think this will be perfect! LOVE this! Where did you find the clothespins? I couldn't find them at Michael's. I'm thinking of doing a long one of these over my couch with a little more decorative pins and some sepia pictures. Great idea! I love this idea very cute for when I get to the stage of hanging art work but for now I think you just gave me an idea for a coat rack!!! Love this! I love everything you do. I hope your move went well. Where do you find the clothespins? That is super cute! Thanks tons, I'll be linking. I love this idea and really want to do it. Question though- I'm new to mod podge so I'm wondering why you put a layer of it on the top and sides of the fabric? very cute! i'll be making one soon! ty! I love all of your other uses for this…..I may have to try some out for myself. I bought the clothes pins at a local craft store so it may be hit or miss when you check your local stores out. Or you may be able to find some online. The pins are about 6 x 1.25 inches and the board is about 24 x 5.5 inches, in case you're wanting to make something similar. Rachel Marie, I mod podge over the top of the fabric to seal it all in. It also keep the fabric from peeling off and is barely visible. You can feel a difference but you can't really see one. It just makes the fabric a part of the board. Try it out and you'll see what I mean!! I found your blog last night and can I just tell you that you have the most cutest, creative blog ever!!! I am SOOO excited to make a lot of the stuff you have made! Thank you so much for SHARING your talent and showing how to make it! You have given me confidence that I can do it instead of buying it! HI! Love your blog! One question where do you find the jumbo clothes hanger?? I love this idea for my grandchildren's craft/art projects! Where can I get those large clothes pins? I love this project!! I am just having trouble findin' those clothes pins!! I am gonna keep looking though! Thanks for the idea! I came across your blog today. You are so talented! I love your blog! I have been looking at it all day! I found some jumbo clips at hobby lobby! Neat idea! i love it! where did you find the jumbo pins! I'd vote for this to show up on Mod Podge Rocks. Very cute. My son made the same thing in summer camp one year (umm, not as "pretty" as this but still cute). He made it specifically for work, where I did use it till I left that job. Now he's 19 and it's still hanging in the kitchen and I must say it is pretty darn useful. It really works well. Lots of possibilities with this project from a pretty one like yours carefully coordinated to the decor, to a simple kid's craft, to ones with labels for specific info. So low tech but so useful. so cool, can't wait to try this! Could I use only hot glue? I dont have mod podge… Or would not work it? This is a great idea! I want to do something like this across the “big” windowless wall in my dd’s room.